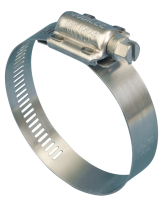 Jubilee® High Torque clips are made of all stainless steel, with a two part housing and cut through band, keeping the band straight at the point of engagement and fully engaging all of the screw thread; giving a superior tightening torque. Although not suitable for use on soft hoses, where the high forces and perforated band may cut into the hose, they are ideal where a high clamping force is required and with a flexible band material they can achieve a high level of friction even against a smooth surface such as a metal pole. These clips conform to SAE J1508 type HD.